[Ottawa – June 11, 2014] – Wynne has recaptured what was a highly stable, modest lead (37.3 per cent, versus 31.3 for the Progressive Conservatives). The about-to-conclude 41st Ontario general election has been an interesting and closely contested contest. It featured an unusually stark choice between two highly contradictory policy visions – a minimal government, austerity platform which assigns responsibly for growth and prosperity to the private sector and a progressive state model which sees government as both a source of insulation from the fallout of a slow-moving economy and as an agent of stimulus during a period of relative stagnation. Superimposed on this issue was the other master issue of the election; the issue of regime fatigue and high concerns with the ethics and accountability of the veteran Liberal government. Other issues such as leadership also played into this campaign but those were the two dominant issues. In short, Wynne appears headed for a victory. Indeed, with these figures, combined with a six-point lead among likely voters, Wynne is likely headed for a majority. Opening Act. NDP pratfall following decision to bring down the government over a budget seen as more than acceptable compared to the dark alternative that Tim Hudak would offer. Confused and disappointed members immediately defect, leaving Horwath out of race she was tied in the week before. Act Two. A steady but modest and stable lead emerges for Kathleen Wynne who seems to winning the policy vision battle of night watchman versus activist state. Act Three. The post-debate boost to Hudak as he successfully shifts from the policy debate he was losing to a focus on ethics and accountability which is low ground for Wynne. For the first time in the campaign Hudak runs ahead on two separate nights and he has momentum. Act Four. 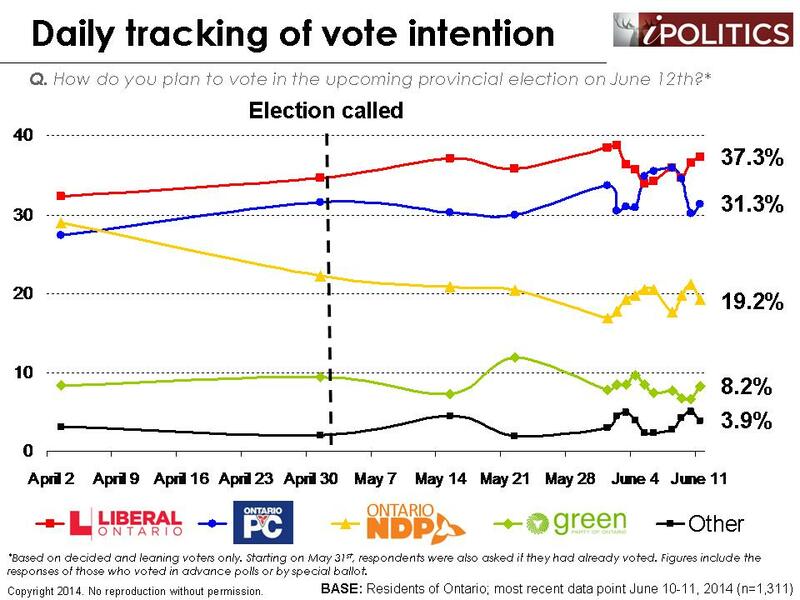 Regression to mean as the Hudak bounce retracts to the pre-debate (Act Two) patterns and Wynne rebounds. Act Five and the Closing Curtain. While the denouement is “not over ‘till it’s over”, it appears that Wynne will succeed in the initially improbable goal of securing a new mandate and quite possibly a majority. Exit Hudak and Wynne stage left? Whether this is tragedy, comedy, or just a yawn depends very much on where one sits in the political spectrum. While it may seem rather surprising in light of the various claims about what the end results would be, it is notable that this result is really not that different from the results we saw in 2011 and will not come as a great surprise to the public. Without further drama, here are our final results based on the last two nights of polling. We offer first our likely voter results, which is our best guess at what the final ballot tally will look like. We also offer the final results of what all eligible voters would have preferred. Before offering up some further diagnostics and analysis of the underlying demographic and regional patterns, we do need to explain why it is necessary to have both a likely and all-voter model and how the likely voter model was constructed. In a more perfect world, most voters would vote and those who didn’t would look very similar to those who did. This relatively more perfect world used to exist and it made the job of polling much easier and the task of evaluating pollsters much more straightforward. Alas, the new world of the permanent campaign sees many non-voters and, sometimes, more non-voters than voters. Moreover, not only are voters and non-voters systematically different, but the campaigns actively try and target those segments in order to get out (or keep home) those who are seen as helpful or harmful to their prospects for success. Therefore, good polling must both model the known population of all voters and be able to make a reasoned conjecture at the portion who will show up. There is no textbook likely voter model and even ones which we can retrofit to the past have no assurance of working in the future (the problem of induction). We have looked carefully at what terms we can measure to come up with a reasoned guess based on observable patterns. The final model is presented below (and yes, it has been tweaked a bit to bring it into close correspondence with what we expect given past patterns). For example, if the model shows five per cent voting “other”, it is clearly flawed and needs adjustment. We focused only on tracking the unadjusted numbers during the campaign in order to provide a semantically consistent and unbiased time series for those following. The final likely voter model is unabashedly focused on one task – guessing at turnout in order to minimise the gap between predicted results and observed reality. We have made two changes to our likely voter model since our last report. First, we no longer award additional points to those with a college or university education. This is because our analysis showed a high degree of correlation between educational attainment and likelihood to have voted in past elections. In effect, we believe we were double-counting college and university graduates by including this adjustment. Second (and this may seem more controversial to some), we believe that our poll is exaggerating support for the Green Party and “other” parties. This is due to a combination of social desirability and those respondents who are simply so disheartened with the other party choices that they are simply choosing “none of the above”, rather than expressing a genuine party preference. Indeed, in our final 2011 Ontario Election poll – a survey which otherwise nailed the election result – Green Party support was exaggerated by a factor of two, while “other” was also overstated by a wide margin. For this reason, we are down-weighting Green Party and “other” support by these same margins. Past vote behaviour (maximum score of 2 points). The respondent receives one point if they voted in the 2011 federal election, one point if they voted in the 2011 Ontario election, and two points if they voted in both elections. Emotional engagement (maximum score of 0.5 points). The respondent receives half a point for indicating that they are either angry or hopeful when thinking about Kathleen Wynne’s Liberal government. Intention (maximum score of 2 points). The respondent receives one point for rating their likelihood to vote as six (out of seven) or two points for rating their likelihood to vote as seven (out of seven). Alternatively, the respondent receives two points if they say they have already voted. Knowing location of polling station (maximum score of 1 point). The respondent receives one point if they “clearly” know the location of their polling station. Alternatively, the respondent receives one point if they say they have already voted. Age (maximum score of 2.5 points). The respondent receives 2.5 points if they are 65 or over, two points if they ages 45 to 64, and one point if they are ages 25 to 44. Finally, we tally the scores and identify the ~50 per cent of the population that is most likely to show up and vote on Election Day. In this case, we take all those respondents who score 6.0 or greater (out of a maximum possible score of 8.0). The demographic patterns are clear and revealing. For example, we find that Tim Hudak has shown a much stronger appeal with older males and with college graduates, but not the university educated. His supporters also revealed an “angry” emotional response to the current premier. Kathleen Wynne found greatest favour with the university educated and women, and she did well with boomers as well (all categories that she enjoys membership in). Her supporters viewed her in a “hopeful” fashion. Andrea Horwath had a less distinct constituent profile which was somewhat lower socioeconomic status and younger. 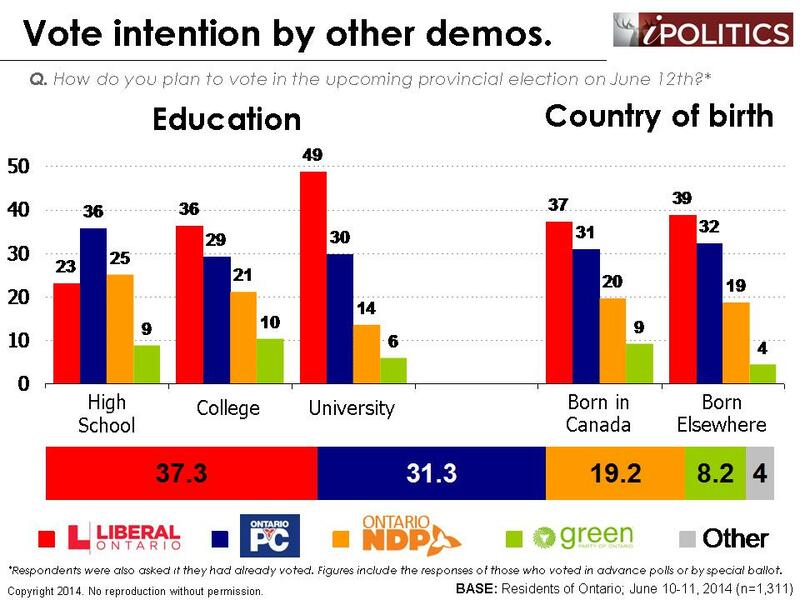 They were also more “discouraged” and this combination of demographics and engagement augurs poorly for the turnout of Horwath’s already diminished base. We await with more than a little curiosity the outcome of this race. We congratulate the candidates and leaders who had the courage to throw their hats in the ring. We congratulate the voters who have the commitment to actually show up and be counted. We thank the several thousand patient respondents who generously shared their views. We also thank our sponsors at iPolitics who have staked out an interest in a more ambitious program of research. We also acknowledge the skill and commitment of our colleagues and competitors who enter the arena of political polling in an era of diminished resources and rising methodological challenges. The field dates for this survey are June 10-11, 2014. In total, a random sample of 1,311 Ontario residents aged 18 and over responded to the survey (including a sub-sample of 1,078 decided voters). The margin of error associated with the total sample is +/-2.7 percentage points, 19 times out of 20. Congratulations again Frank – even if no one wants to give you the credit you deserve for calling it. It made the last few days rather relaxing for me (although terribly annoyed at the media – particularly the CBC since they had your polls). I’ve been going “I told you so” on my Facebook.